Easy Bread Pizza Recipe – Love Pizza? Then try this instant pizza recipe. Perfect for kids as well as for grown ups. Snacks are an important part of our daily diet. We love to eat snacks at tea time or just before our dinner or before our lunch. If we have a party at home, then also we prepare tasty snacks for our guests. If there is a birthday party at home then also we prefer to prepare homemade snacks instead of ready made snacks. Pizza is undoubtedly one of the most popular and loved snacks. We all love to eat it whenever we go out. Now if you don’t have time to prepare a pizza or if you don’t have pizza base at home then also you can prepare a pizza which tastes just like the original Pizza. Here’s how to do it – you can use bread as the pizza base. The rest of the ingredients remain the same like the topping, sauce, cheese etc. This recipe is perfect when you have to prepare some instant snacks – may be for some party, for kids tiffin box or may be for eating during the meals. So, just like the regular pizza, you can prepare this instant bread pizza in an oven. the procedure is exactly the same. You will bake these bread pizzas at 180 C/350 F for approximately 10 minutes. 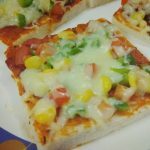 Now if you don’t have an oven, you can still prepare these easy bread pizza either in a microwave or on traditional Tawa. If you have to prepare these bread pizzas in a microwave then put these bread pizzas on the turn table. Keep the turn table in the microwave and select the Micro + convention button. Select the time as 3 minutes and press the start button. These bread pizzas usually get ready in three to four minutes in the microwave. Now if you do not want to bake these bread pizzas in either the oven or the microwave then simply bake these on the gas stove using a tawa/pan. Place the tawa/pan on the gas stove. Keep the flame low. Heat the tawa foe 1-2 minutes. Then place these bread pizzas. Cover these with a glass lid or a deep bottom steel bowl. Keeping the flame low, bake these bread pizzas for four minutes or till the cheese melts and gets a light golden color. Thus as you see there are multiple ways in which you can bake these bread pizzas. Bread pizza is perfect for after school snack or tea time snack. As they get prepared in such small span of time. If you have a birthday party at home then these are probably one of the best snacks to serve to the guests. Especially if it’s a kids party, then all the kids would love to eat these bread pizzas. Do try this recipe. 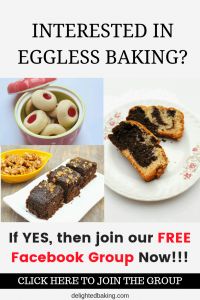 If you have any questions regarding this recipe feel free to ask them in the comments below. Take a bread slice. Apply pizza sauce on it. Sprinkle some mixed herbs on top. # For baking in Oven : Preheat the oven to 180 °C. Bake these at 180°C for 10 minutes. # For baking on Gas stove : Place a tava on a gas. Heat it on a low flame, for 3-4 minutes. Place these bread pizzas on tava. Cover this with a lid/big bowl. # For baking in a microwave : Place the bread pizzas on the round table. Select the 'micro+convection' button. Select the time as 4 minutes and press the start button. Cook till the cheese melts. Yummy bread pizza is ready!! !